Background/Purpose . 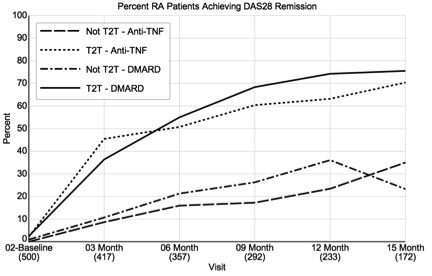 There is limited data on adherence to treat-to-target (T2T) strategies in RA in real world-practice and the impact of failure to adopt this best practice on clinical outcomes. We aimed to assess the impact of failure to adhere to T2T across 10 countries participating in the RA BIODAM program. Methods . RA BIODAM is an international multicenter (35 sites, 620 patients) 2-year prospective study aimed at the clinical validation of biomarkers. Active RA patients are assessed for disease activity every 3 months with a prompt to make major treatment changes in order to achieve a DAS target of ≤2.4. An internet-based data entry and management system (IDEMS) was designed to automate calculation of the DAS and alert sites to the requirement for treatment change. If a treatment change was not made a reason for that decision was required. RA outcomes (HAQ, RAID, SF36) and attainment of remission (DAS, CDAI, SDAI, ACR Boolean) were compared by adherence to T2T and according to treatment category (DMARD, anti-TNF). Results . As of June 2014, 500 patients have been recruited of whom 172 have completed at least 15 months follow-up. Adherence to T2T was 52% and non-adherence 42% for at least 1 study visit (the T2T failure visit). Reasons for non-adherence were: physician decision that current treatment was acceptable (69%), physician decision (other) (14%), patient decision (9%), physician decision due to concern for adverse event (2%), other non-specific (6%). Starting at 6 months of follow up and continuing to diverge though 15 months, all outcomes were superior in T2T adhered patients: improvement in SJC/TJC, patient/physician global, HAQ, RAID, SF36. 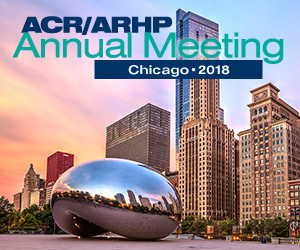 Remission at 15 months follow up was more frequent in T2T adhered patients at 75% (DAS), 41% (CDAI), 41% (SDAI), 40% (ACR Boolean) compared to non-adhered patients at 30% (DAS), 12% (CDAI), 13% (SDAI), 15% (ACR Boolean) irrespective of therapy (standard DMARD, anti-TNF). Median data for DAS components at the T2T failure visit was 9 and 4 for TJC and SJC, 5 for patient global, and 16 for ESR (40.0% with ESR >20). At the subsequent visit, there was still no change in treatment in 37% despite DAS > 2.4: median was 10 and 4 for TJC and SJC, 5 for patient global, and 22.5 for ESR (54.0% with ESR >20). Conclusion . Adherence to T2T is associated with consistent improvement in RA outcomes and increased rates of remission. However, there remains a substantial gap in implementation even in protocol-specified clinical settings.